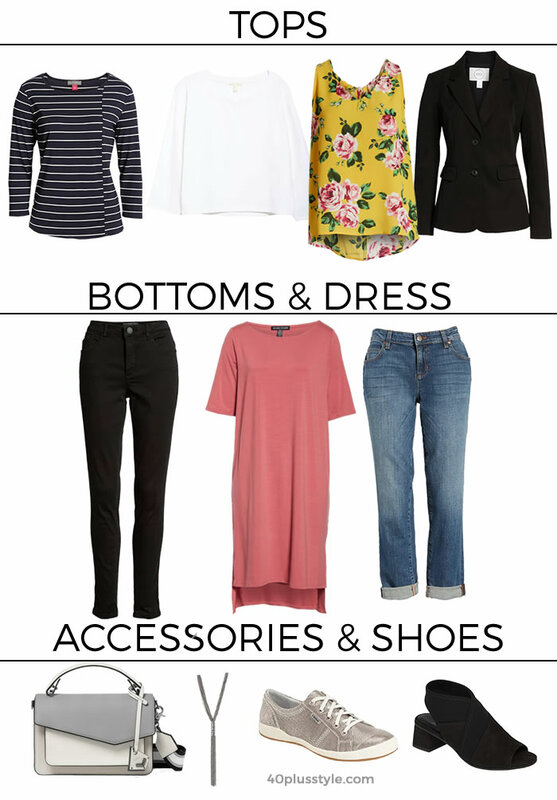 40+ Style » What to wear » A capsule wardrobe for easter break – 11 items create 9 unique outfits! Easter is coming and for many of you that may mean a short break. You may be going for a short city trip or spend some time in nature. In any case, I think you will need a casual capsule that will easily fit in a carry on and that can take you from day to evening. I’ve partnered with Nordstrom, one of my favorite online stores, and I’m ‘m going to concentrate on creating a capsule that is both comfortable AND stylish. Nordstrom is the ideal place to create your capsule as this one shop has it all. From affordable good quality clothing to high-end design. I’ve focused on quality pieces that are still affordable and that will last you for multiple years. I’m envisioning a city trip where you will do lots of sightseeing and walking around. You will go out for meals in the evening, but you prefer to go to casual places. You want to pack light but still look stylish every day without having to wear the same thing all the time. 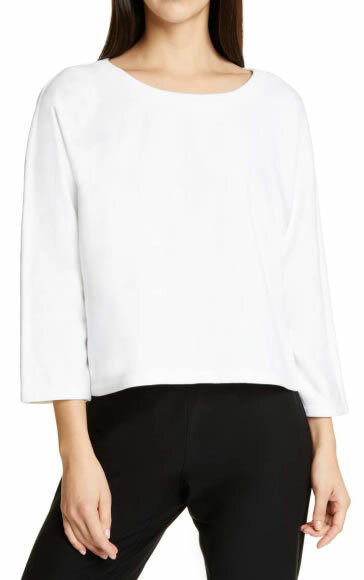 This top can be worn on its own or layered underneath a jacket. Its cropped length is perfect for boyfriend jeans and high rise pants. You could also wear this with a skirt if you prefer to take a skirt instead of pants. You could even wear this over your dress. A printed top adds some pizazz to your style and this bright top will make your neutrals shine. Wear with either your jeans or black pants and add your jacket if it’s chilly. A stripe is like another neutral but adds more interest. 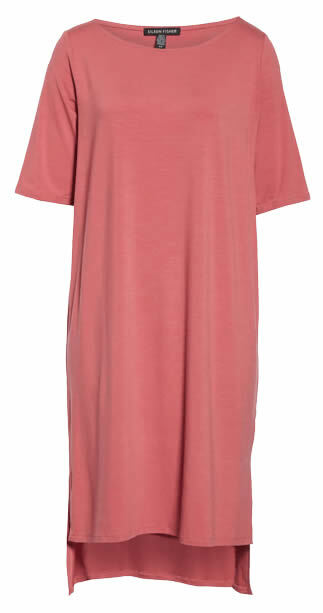 This is the perfect top to wear if you’re more in a neutral mood but still want to to look stylish. 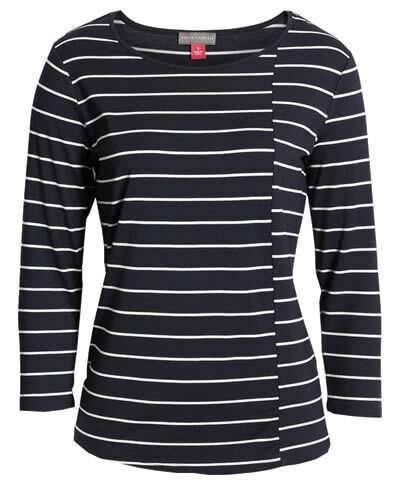 Rather than just a standard stripe this asymmetrical stripe looks more edgy and fun! 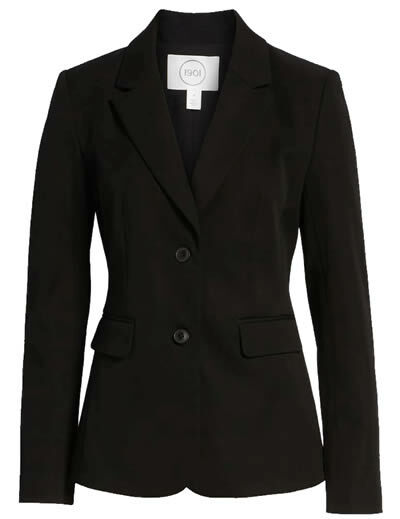 A blazer makes any outfit just a bit dressier and is ideal to wear with jeans. The stretch makes this jacket good for both casual day-to-day activities and the evening. It looks great with your dress too! High rise is back in favor and is perfect to tuck your tummy in. It also allows you to create the silhouette you need. Your tops can be a bit shorter which has a lengthening effect for your legs. 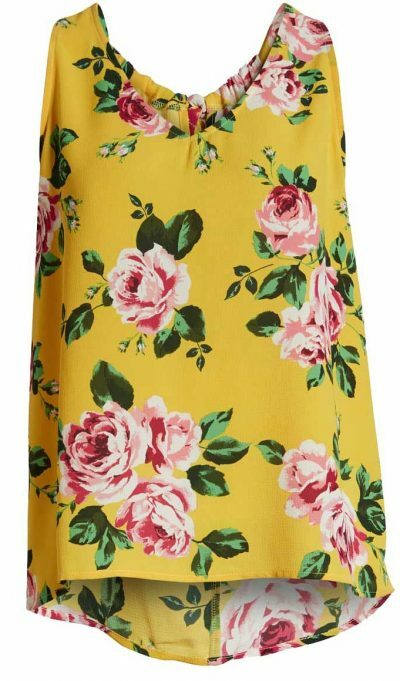 This dress is comfortable and can be dressed up or down. And if you don’t like this brighter color, then choose from the 5 other color options (including black). Wear loose as a casual dress for day. You can also belt it and wear over your skinny pants. When you’re visiting a new city you’ll be doing a lot of walking. 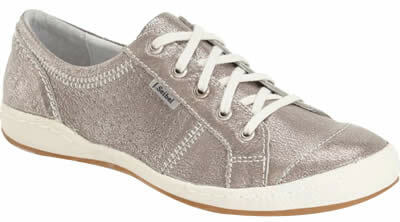 These comfortable sneakers will keep you comfortable. 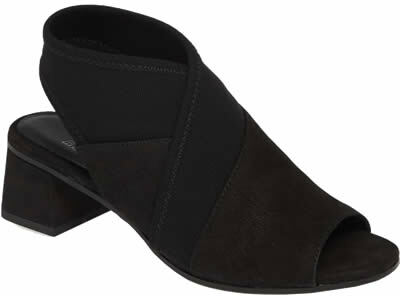 If you prefer to wear dressier shoes for the evening, then these Eileen Fisher shoes will fit the bill. Edgy and fun, yet comfortable these shoes will take any outfit to a new level. A statement necklace is the finishing touch to your outfits. Our plain dress and tops especially will be further enhanced. Your outfit is not complete without a fabulous bag and this Botkier cross body bag fits the bill. 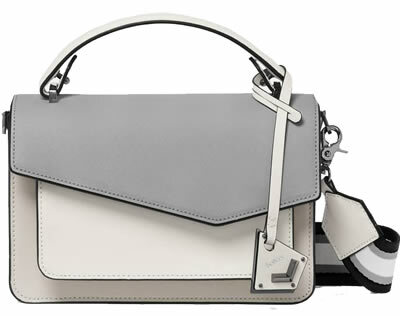 The multiple, but still neutral, colors in this bag will instantly make any outfit more interesting. The asymmetrical details make your look more edgy too. A cross body bag is super practical for traveling and this one can become your new day-to-day favorite! Note that I didn’t pick pieces in similar colors. That is a mistake I see many women make when they create a capsule wardrobe. Of course similar colors would look good on the image (or on your bed when you’re sorting the clothes) but similar colors will also result in similar outfits. You want to create variety in your capsule so that your outfits are very different. Even though the colors are different, every top can still be worn with every pants and the jacket goes with all bottoms. And here are all the fabulous outfits you can create! Want to further extend this capsule? These 10 pieces will be (almost) everything you need for your trip. But of course you can easily extend this capsule by adding additional items. But for a short 3-4 day trip, this is all you need! Want to get help creating your wardrobe (as one big capsule)? 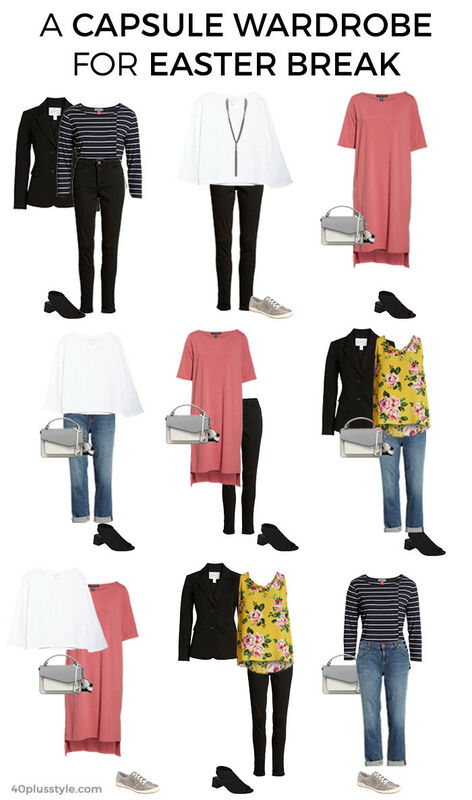 Why not create your whole wardrobe like one big capsule! Make sure any items you add to your wardrobe go with at least 2 other pieces in your wardrobe. That way you will create a wardrobe full of options and you will always have something to wear. If you want more help creating your wardrobe you may want to try Nordstrom’s stylist services. Professionals can help you create a wardrobe that will suit your body type, style and preferences. It will ensure that you have a wardrobe that will always give you something to wear. 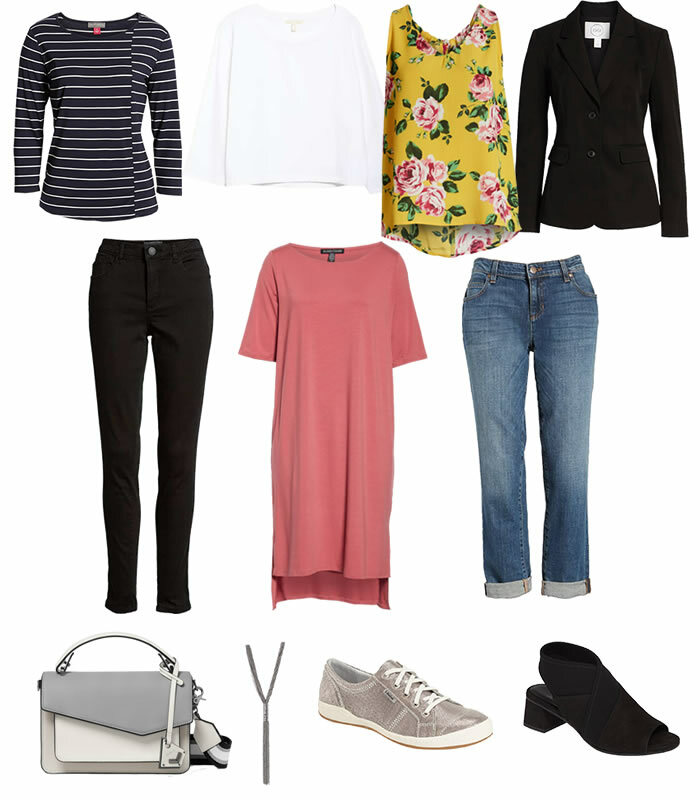 How would you create your capsule wardrobe for an easter break trip? Thank you for working with Nordstrom. I just ordered 2 of the items. Great capsule! Fabulous Ann! What did you get?